Hands up: Stipe Miocic (L) lets fly at Junior Dos Santos in their UFC heavyweight championship fight at the American Airlines Center in Dallas. 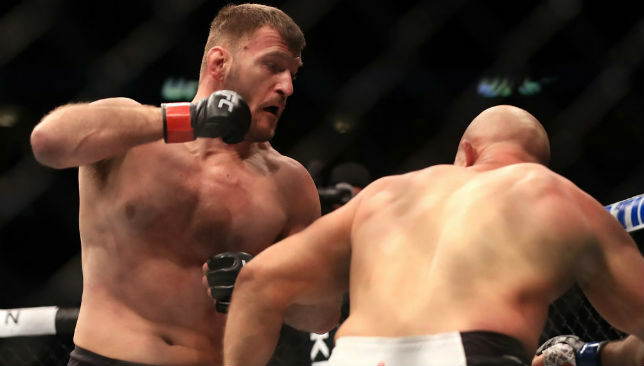 On May 14, 2016 Stipe Miocic shocked the world, and himself, to become the UFC heavyweight champion. On May 13, 2017 Miocic tied the record for defences of that belt and nothing about the nature of his achievement is all that surprising. Indeed, it’s a testament to the 34-year-old’s development over the last 12 months that he has gone from unexpected champion to potentially one of the best heavyweights of all time. Andrei Arlovski, Fabricio Werdum, Alistair Overeem and now Junior Dos Santos have all consecutively been taken out in the first round and the formidable run has allowed Miocic to grow in stature and stand on the verge of history. By levelling Dos Santos in the main event of UFC 211 on Saturday, the American joined Cain Velasquez, Brock Lesnar, Tim Sylvia and Randy Couture in defending the belt twice. But the incumbent champ stands the best chance of any to make it three because he hasn’t just build a stellar record. Indeed, with each victory Miocic has grown in confidence. There is an impregnable belief, even a slight tinge of healthy arrogance, that he won’t be beaten. Look back to UFC 198 after he claimed the belt and the contrast 12 months on is obvious. “I’m a world champion! I’m a world champion,” he screamed atop the cage after stopping Werdum. In May of next year the conversation could turn to discussing Miocic as the greatest heavyweight of all time. Only Velasquez can provide a stern counter argument against that but the former champion has spent more time in hospital theatres than he has arenas of late. If the 34-year-old can get healthy, and crucially stay health, it is the fight to make but there are other options for Miocic. Werdum and Overeem will clash at UFC 213 in July and the winner of that will be right back in the mix. There’s also the raw but dangerous Francis Ngannou who has racked up a 10-1 record in the same time Velasquez has gone 2-1 to surge into the top five. Whoever is next has it tough and UFC 211 further emphasised that point. 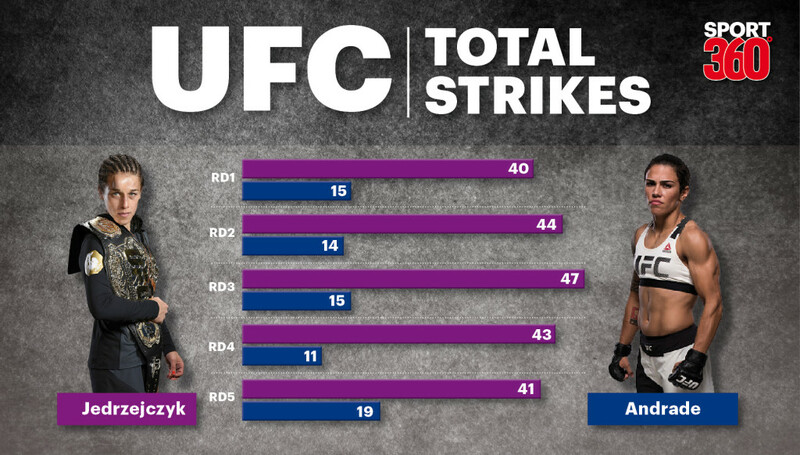 Miocic is not the hardest hitter, relative to the division, but the speed of his delivery and the precision with which he connects means he doesn’t have to be. The Cleveland native stood in the pocket with JDS, a high-level striker and one of the best boxers in MMA, because of the confidence he has in his speed and accuracy. That’s not to say Miocic is unbeatable because the volatile nature of the division has taught us better but history beckons for the part-time firefighter. “Heavyweights, man, it’s tough. I’m sad, of course. I’d like to become the champion. But if I’m not the champion I’m glad this guy is the champion,” the challenger said. While Miocic’s path towards greatness is just beginning, another winner at UFC 211 may already be there. Strawweight champ Joanna Jedrzejczyk moved to within one of Ronda Rousey’s prestigious consecutive title defence record after a clinical one-sided decision against Jessica Andrade in the co-main event. The pound-for-pound best female fighter remains undefeated as a professional and has defended her 115lbs title five times after what she described was her best performance to date. It’s hard to argue with that assessment because the Pole was simple levels above a limited but game Brazilian after a mesmeric performance. Jedrzejczyk is arguably the best technical striker the UFC has ever seen and combined with her speed and stamina, she’s become an unstoppable force. At UFC 211, two champions closed in on two title records and both reinforced the argument they are the very best in the world.